The 2017 WaterFire season schedule was just released this past Tuesday, May 2nd after much anticipation. This year there will be 10 full lightings and 2 partial basin lightings.This amazing work of art draws millions to Providence each year. 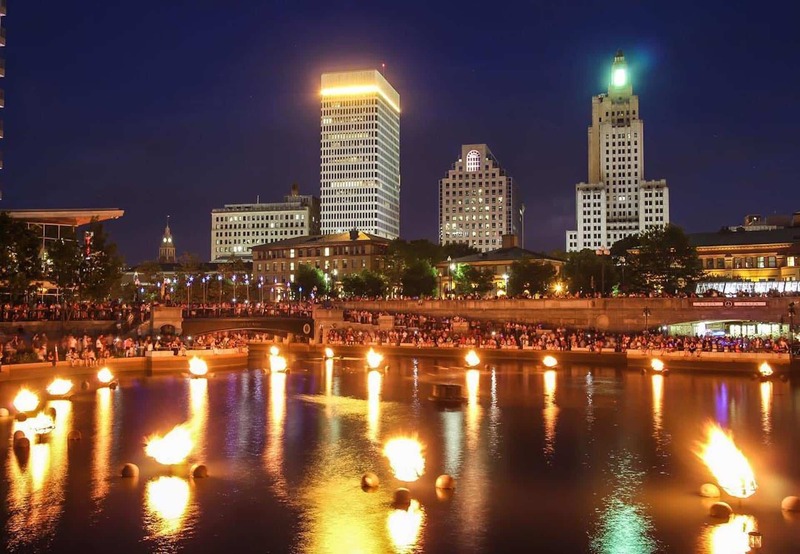 Barnaby Evans, the artist who designed this amazing work of art, had created the first fire back in 1994 to celebrate the 10th anniversary of First Night Providence. Then 2 years later he created the second fire for the International Sculpture Conference. At that time passionate art supporters persuaded Evans to create a seasonal WaterFire installation. Then in 1997, WaterFire became a non-profit arts organization supported by volunteers, donations and the city and state. The flames have been burning bright ever since. Over the years, WaterFire has expanded from 42 braziers to now having 97. These braziers can be seen on the three rivers of downtown Providence: Woonasquatucket, Moshassuck and of course the Providence River. The ambience of WaterFire can be enjoyed from alongside the river or by boat and gondola. The Providence Riverboat Company runs continuously through the night with 30 minute rides. Reservations are highly recommended as rides do sell out. LaGondola offers a unique perspective aboard their authentic Venetian gondolas. You may call LaGondola to book a trip for WaterFire lightings. If you are looking to stay nearby, our inn is within walking distance to Waterplace Park where WaterFire takes place here in Providence. Call to book your stay with us before we fill up for the lighting season! This entry was posted in Providence Attractions, Providence Events, Rhode Island Attractions, Rhode Island Events by admin. Bookmark the permalink.